From the author of The Crêpes of Wrath comes another decadent cozy mystery. This time, pancake house owner Marley McKinney is tangling with a salty troublemaker . . . and a ravenous killer. Tourist season’s in full swing in the small seaside town of Wildwood Cove, and Marley McKinney couldn’t be happier. Since taking over the Flip Side restaurant, she’s made a few close friends, adopted a cat named Flapjack, and started dating her childhood crush. The only cloud on the horizon is local nuisance Ida Winkler, who blames Marley for landing her nephew in prison. Trying to get a rise out of Marley, Ida’s been making crank calls and even vandalizing the pancake house. The police can’t do much about the pranks, so Marley sets out to bury the hatchet once and for all. But someone’s beat her to it—in the most shocking way possible. After stumbling across Ida’s dead body, Marley’s suddenly the number-one suspect in her murder. Clearing her good name is going to be a tall order, but Marley’s not about to let Ida keep ruining her life—especially from beyond the grave. 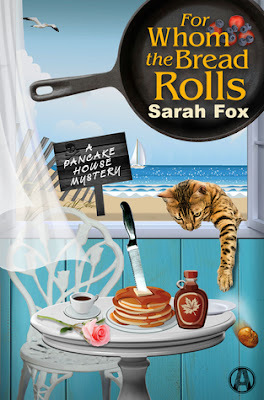 There are times when nothing will suit as well as a mystery and thanks for Ms Fox, I have discovered that I especially enjoy the cozy mystery genre and especially this series. This book has a lot going for it. First of all, the characters are all so well developed and well...real. They remind me a lot of some of my friends especially as they are animal lovers also.And the setting itself is one that is local to me which adds just another touch to love. And let's not forget Ivan's recipes that are in the back of the book. Yummy! I do highly recommend this book and this series to any of my readers who enjoy cozy mysteries. They are just perfect to read while sipping a mug of tea.